Your go-to checking account. Great for everyday banking whenever and wherever you need it. Already a member? Sign-in to open. Because you shouldn’t have to put in work to get a free checking account, and you shouldn’t have to wonder if you make the minimum balance requirement either. Keep an eye on your finances with free monthly credit score - delivered directly to your online banking account each month. Receive custom alerts about your debit card activity sent to your mobile phone and email address. Update your preferences online, anywhere, anytime. We've got your back. Be covered when you overdraw your account in emergency situations. Access your account information, transfer funds, or pay bills whenever you need to by logging in to our online banking portal or mobile app. You never know where life is going to take you. 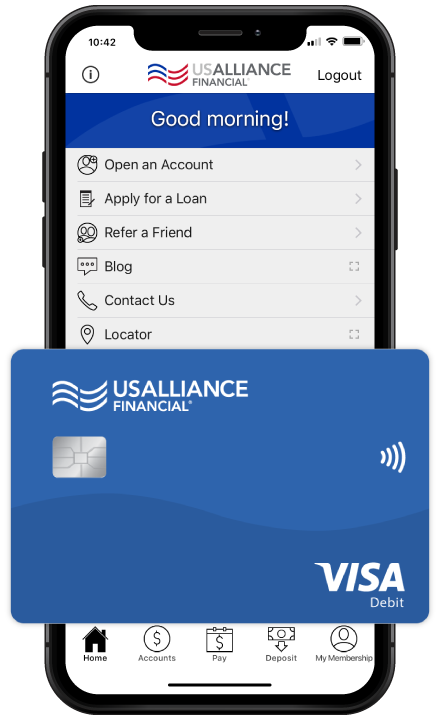 You’ll have access to over 30,000 surcharge‑free ATM fees, but we’ll also rebate you $15 per month in non‑USALLIANCE ATM fees. Order additional checks via online banking or our mobile app. Enjoy the peace of mind that comes from knowing your funds are secure. 1 Early Pay Direct Deposit is a benefit provided by USALLIANCE Financial and is not guaranteed; early deposit may be up to two days early of your actual payment settlement day but is contingent upon the receipt and successful processing of the deposit from your payor/employer. USALLIANCE Financial does not have control over when your funds are received from or sent by your payor/employer. For questions regarding your payment date, please speak with your payor/employer. 2 Apple Watch and Apple Pay are registered trademarks of Apple Inc. Google Pay is a trademark of Google Inc. Samsung Pay is a registered trademark of Samsung Electronics Co., Ltd.